It is hard to find feminine and elegant gemstone clip on earrings, isn’t it? If you look for local shops, there is no hope to find them. And then you look for them online, you hit so many gemstone earrings, not CLIP ON EARRINGS. Finally you found some gemstone clip on earrings, but they are simple stud style clip on earrings not like dangle feminine style. And you wonder “Where can I get my ideal gemstone clip on earrings?? 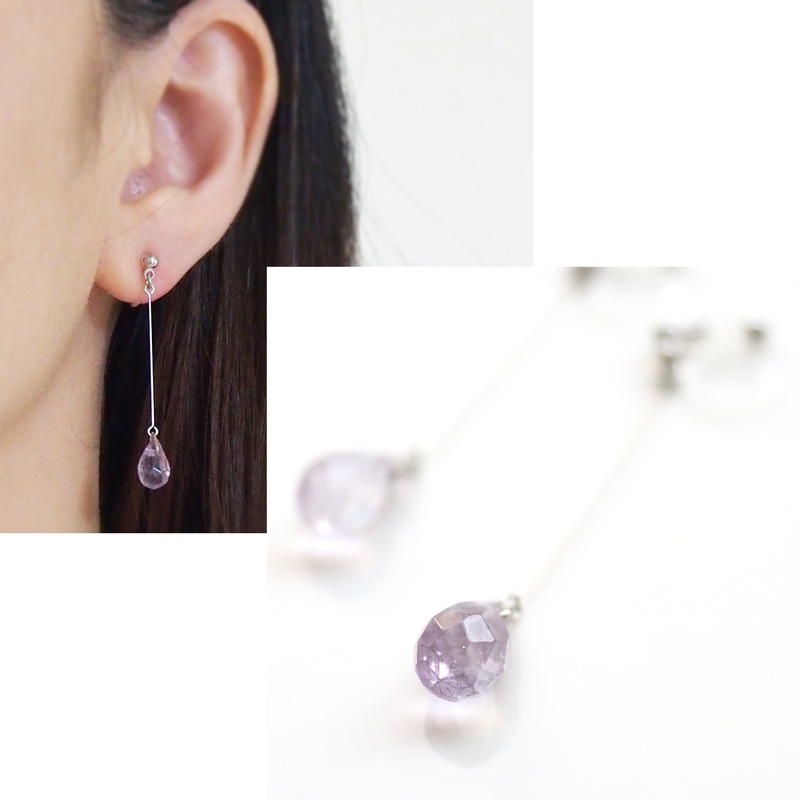 ?” Here is the place you can find your ideal gemstone clip on earrings, MiyabiGrace. Today I would like to introduce 2 style of amethyst invisible clip on earrings: Dangle teardrop shape hoop amethyst invisible clip on earrings and dangle teardrop amethyst invisible clip on earrings. Hoop earrings are the one of the clip on earrings which is hard to find and our dream earrings. I wanted to make these graceful and sophisticated style, so I used teardrop shape hoops. And I added the clear amethyst beads and silver tone beads at the bottom of the hoops. The amethyst crystals catch sunlight and sparkle! And they move around your face elegantly and bright you up! These earrings are minimalist style: simple but feminine style. They are image of dewdrop from the flowers and pure. They match any outfits and you can wear every day! If you are looking for everyday simple earrings, these are ideal for you. Please look at closely. They seem pierced earrings! Why they look pierced? The clear clip on earrings are used for these and it is hard to recognize that they are clip on earrings. So you can wear them as if you wore pierced earrings. Moreover, they are comfortable to wear. The earring findings are soft and fit your earlobes perfectly. So you can wear those straight 12 hours. This is totally new experience for you. If you want to know the details, please check my customer’s review about invisible clip on earrings. Other gemstones like colorful agate invisible clip on earrings are also available. More gemstone invisible clip on earrings…. < Previous 3 criteria of bridal clip on earrings: 1) elegant 2) comfortable 3) pierced look. Here is the clip on earrings which meet all the criteria! Next > Do your trendy clip on earrings hurt a lot?